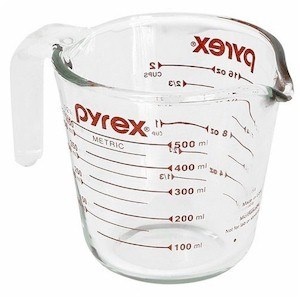 Did you know that liquid measuring cups and dry measuring cups can yield different amounts? When measuring dry ingredients scoop and sweep off the excess with a flat utensil. When measuring a liquid, fill the cup to the marking and get down at eye level to make sure the meniscus reaches the desired mark. This is especially important for baking when ingredients must be quite accurate for a recipe’s success. When it comes to counting calories being slightly off day after day can lead way more/less calories than desired. If you want to be 100% accurate use the scale.